posted by Billie Owens in business, batavia, news, Kmart. The Kmart on Lewiston Road in Batavia is one of 142 stores owned by Sears Holdings Corp. to be shuttered by year's end. Liquidation sales are expected to begin soon. The manager of the Batavia store, located at 8363 Lewiston Road, referred us to a corporate spokesman but we have been unsuccessful in contacting him to find out how many local employees will be out of a job. There are about 700 stores currently open, down from 3,453 stores in 2005 when Kmart Holding Co. bought and merged with Sears Roebuck & Co. in a cash and stock deal then valued at $11 billion. The new entity became Sears Holdings Corp.
Sears Holdings has filed for bankruptcy and plans to reorganize its massive debt and reemerge on more solid ground. It reported liabilities of $11.3 billion and assets of $7 billion. A $134 million debt payment was due that it could not make at the time of filing. Under the safety net of Chapter 11, Sears Holdings will be able to remain open through the holidays while striving to square away its finances. But retail business analysts say returning to a position of strength and relevance will be difficult to do. Since the hoopla surrounding the merger in 2005, the parent company has struggled with anemic sales, crippling debt and shifts in consumer spending, especially the juggernaut of e-commerce. One advantage e-commerce formerly enjoyed was not having to collect sales tax. But over the years, most U.S. states passed online shopping sales tax laws. Even so, about half of all Amazon.com purchases, for example, are sold on its Amazon Marketplace through third-party vendors, and these purchases remain tax free (with the exception of Washington state). More to the point, critics say Sears Holdings Corp. is not faring well because it has not reinvested in decaying stores; and it sold off iconic brands like Craftsman tools without giving consumers new brands and incentives to buy. The down slide has been going on for so long, they say, the retailer has become irrelevant and consumers are moving on. Sears Roebuck & Co. started in 1886 and was able to grow by leaps and bounds thanks to its the proliferation of its mail-order catalog business, using the U.S. Postal Service to deliver goods from its Chicago warehouse to growing suburbs and the hinterlands beyond them. For generations of American families, stores coast to coast sold everything to everybody -- studio portraits and Goodyear tires, Kenmore stoves and Craftsman tools, home goods and engagement rings. And the "Blue Light Specials" of its once-feisty rival Kmart are pure Americana. A store associate would announce a hot deal over the loudspeaker by saying: "Attention Kmart shoppers..." and the blue lightbulb would flash and for the next 30 minutes, say, there would be a deal in the Shoe Department on bags of tube socks. "It's always sad to see a local business close," Genesee County Chamber of Commerce President Tom Turnbull told our news partner WBTA late this afternoon, adding that Kmart has been in Batavia a long time and he remembers when it was at the other end of town. "But that's the circle of life," Turnbull said. "Others will step up and take its place." posted by Virginia Kropf in Bell Boyz Barber Shop, batavia, business, news. Owning his own business was Roy Bell Jr.’s dream, and with help from the Batavia Development Corporation, his dream is coming true. On Saturday, along with Genesee County Chamber of Commerce President Tom Turnbull and representatives from the BDC, Bell and his family cut the ribbon to celebrate the opening of his own barbershop. His business is located in his home at 49 Buell St. in Batavia. While working for someone else, Bell attended barber school and began cutting hair in the kitchen of his upstairs apartment. With guidance from the Chamber and a loan from BDC, Bell was able to rent a house, remodel the downstairs and buy the needed equipment. He had no trouble deciding on a name for his new shop. With two young boys, 8 and 11, who already take an interest in the barbershop, Bell chose the name “Bell Boyz Barbershop.” It is his hope to someday leave the shop to them. He offers full barbershop services, including shampoos, straight razor cuts, hot towel shaves, facial massages and more. He would like to get into offering “diva curl,” a process of washing hair with a special shampoo, all chemical free, to bring out the natural curl. All haircuts are $13 on Mondays and he plans to offer raffles and other specials during the week, such as $10 brush cuts on Wednesdays or bring someone in on Tuesdays and get one-half off the second service. Bell Boyz is open Monday through Saturday – by appointment only. He will accommodate other days by request. Appointments may be made by calling (585) 300-1242. “I want my customers to come as a guest and leave as family,” Bell said. Anyone in the City of Batavia who is interested in starting up or expanding their business can ask for assistance from the BDC. Roy Bell Jr. is ready to greet customers at his new barbershop at 49 Buell St. in Batavia. 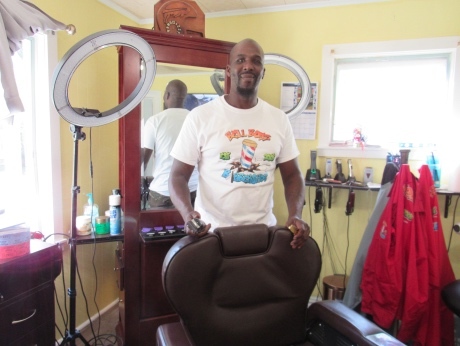 He was able to go to barber school and establish his own business with a loan from the Batavia Development Corporation. Photos by Virginia Kropf. posted by Billie Owens in news, business, batavia, jobs, employment. 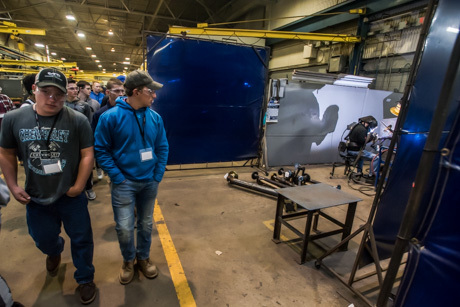 The Genesee, Livingston, Orleans, and Wyoming counties Workforce Development Board will host a Business Forum at the Genesee County Career Center in Batavia on Wednesday, Oct. 17. Time is 1 to 2:30 p.m. This is an opportunity for job seekers to hear directly from hiring managers of local businesses. Job seekers who attend can hear about local job openings and employer expectations. Many of the job seekers that the career center is currently working with are invited to attend, however it is open to the public and would encourage any job seeker to attend the event. Join participants for an informal question-and-answer session with hiring managers from several local businesses, including: Chapin Manufacturing; Lifetime Assistance; Premiere Genesee Center for Nursing & Rehabilitation; Remedy Staffing; and United Memorial Medical Center. Employers' reps may talk about current job openings! The career center is located at 587 E. Main St., #100, Batavia. Phone is (585) 344-2042. Call to sign up or come to the front desk to reserve your spot. posted by Billie Owens in GCC, creativity conference, news, batavia, business. 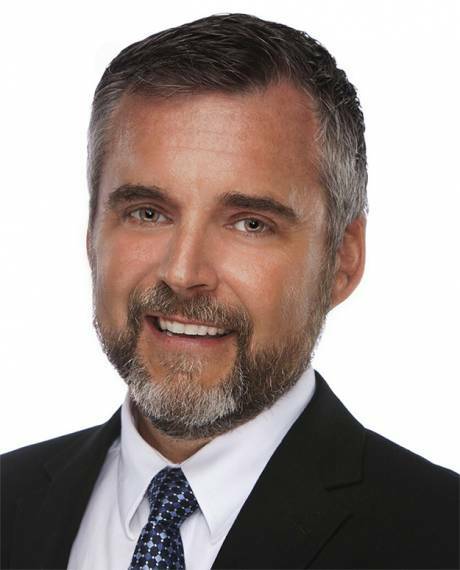 Photo: Trace R. George, GCC Class of 1993, will give the keynote address at this year's Creativity Conference. He owns VSP Graphic Group in Buffalo. The Business and Commerce department at Genesee Community College has announced its sixth Creativity Conference to be held Wednesday, Nov. 14, at the Batavia Campus. Under the theme of "Creativity in the Entrepreneurial Zone," the conference this year will serve both aspiring entrepreneurs as well as existing business owners looking to take their business to the next level. All attendees will have the opportunity to learn from the experiences of our community's leaders through the stories of their own startups and ventures. The conference will include workshops on "How to use Social Media to Grow your Business," "Building Creative Teams," "Developing a Creative Organization," "Personal & Organizational Impact of Creative Style" and more! Small business owners or employees, entrepreneurs and the general public are invited to attend the conference and workshops. The cost is $39 per person, which includes a continental breakfast and delicious lunch. For GCC students, faculty and staff, the conference cost is $25 per person. Seating is limited, so register today! GCC faculty and staff are encouraged to contact The BEST Center to register. Students are asked to register through their instructors. Whether you are launching a new endeavor to taking your successful business to a bigger platform -- let GCC be a resource for your idea and your path to success! 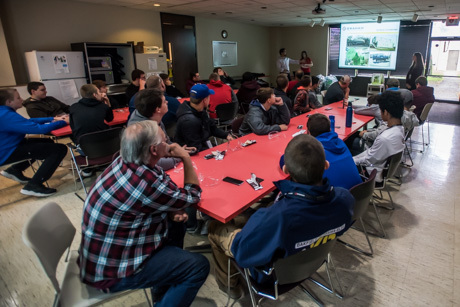 GCC offers both an associate degree and a certificate program on Entrepreneurship. Check out the options here. For more information, contact Director of Business Programs Lina LaMattina at (585) 343-0055, ext. 6319, or via email: [email protected]. posted by Billie Owens in business, tompkins, insurance agencies. Tompkins Insurance Agencies has recently been named the number 1 insurance agency to work for in the Eastern region by Insurance Journal’s 2018 Best Agencies to Work For. This award highlights the importance of competitive salaries, employee benefits, training and education, resources, and other employee perks as drivers of satisfaction in the workplace. The award is based on employees’ responses to Insurance Journal’s Best Agency to Work For survey. Tompkins employees made it abundantly clear that Tompkins’ commitment to serving its community has not gone unnoticed. Tompkins offers 24/7 customer service, participates in numerous charitable initiatives in the community and serves its employees by creating a family-like work environment. Tompkins Insurance Agencies operates 17 offices in Western New York. It is an independent insurance agency offering personal and business insurance and employee benefits services through more than 50 of the nation’s leading insurance carriers. Further information is available at www.tompkinsins.com. posted by Billie Owens in Le Roy, Farmer's Creekside Tavern & Inn, news, business. Farmer’s Creekside Tavern & Inn is transitioning to seasonal winter hours starting Columbus Day. Wednesday -- Kitchen: 11a.m - 9 p.m.; Bar: 11 a.m. - 11 p.m.
Thursday -- Kitchen: 11 a.m. - 9 p.m.; Bar: 11 a.m. - 11 p.m.
Friday -- Kitchen: 11 a.m. - 10 p.m.; Bar: 11 a.m. - 12 a.m.
Saturday -- Kitchen: 11 a.m. - 10 p.m;. Bar: 11 a.m. - 12 a.m.
Sunday -- Kitchen: 11 a.m. - 8 p.m.; Bar: 11 a.m. - 10 p.m.
Farmer’s Creekside Tavern & Inn will still be open for overnight guests as well as prescheduled events, meetings and parties. To utilize the facility for an event, please contact us at [email protected]; we’d be happy to host your next happy hour, board meeting, holiday party, etc. posted by Howard B. Owens in news, notify, batavia, business, p.w. minor. 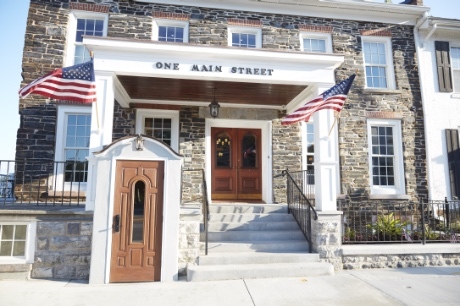 At 10 a.m. today (Oct. 5) Batavia's oldest continuously operating company, shoemaker P.W. Minor, ceased operations. Forty-two workers were laid off last week; 40 people lost their jobs today. Local businessman Pete Zeliff, who, in partnership with Andrew Young, acquired P.W. Minor in 2014, still owns the company's headquarters and factory building at 3 Treadeasy Ave., as well as the production equipment. He was leasing the building to Tidewater + Associates. Zeliff carried the paper on the loan for Tidewater's purchase of the company earlier this year. This afternoon, Zeliff said he foreclosed on the company last week. Last week, P.W. Minor CEO Hundley Elliotte announced the company would eliminate 45 jobs, ending production of its welt boot line, but would continue with orthopedic shoe production. This morning's decision to shut down the company completely came as a surprise to everybody. Zeliff said he has no plans to reenter the shoe business, but he said there is some hope that investors can be found to resurrect at least the orthopedic line of shoes, and perhaps the boot line, and he believes Tidewater is working on finding new investors. We were referred to Elliotte for any questions about the future of the company. We have an email out to Elliotte requesting comment. This afternoon a customer of P.W. 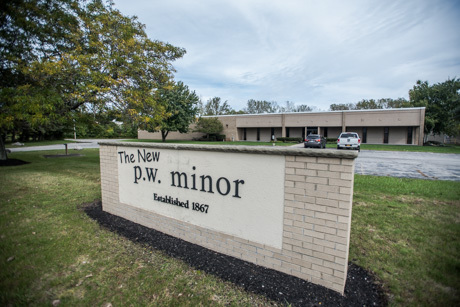 Minor's forwarded an email to The Batavian from Brian Benedict, VP of sales for P.W. Minor, that read, "I regret to inform you that as of 10AM this morning, PW Minor has ceased operation. There will be a formal announcement via email, but since you are drop ship customers who rely on us, I wanted you to know as soon as possible so you can modify your sites accordingly." P.W. Minor LLC, a Batavia, NY footwear manufacturer, has ceased operations as of today and laid off all employees. All assets of P.W. Minor LLC, have been transferred to our senior creditor Batavia Shoes LLC, per an agreement signed today. P.W. Minor, founded in 1867 and located in Batavia, New York, is the second oldest footwear manufacturer in the United States and the maker of orthopedic and diabetic athletic, dress and casual shoes. posted by Billie Owens in batavia, Le Roy, business, news, Mancuso Business Development Group. posted by Howard B. Owens in Ed Arnold Scrap Processors, corfu, business. 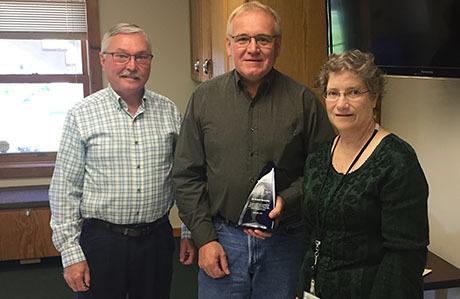 At the Sept. 28 meeting of the GLOW Region Solid Waste Management Committee, Ed Arnold Recycling was recognized for its support of the GLOW Committee and its efforts, along with its overall recycling work. Unbeknownst to the Arnold family, at its June 22 meeting, the Committee passed a resolution that noted, among other things, Ed Arnold’s valuable input to GLOW in GLOW’s formative years, the support they have given to GLOW’s efforts to promote recycling; and contributions to GLOW’s household hazardous waste collection from the time it began in 1996. Ed Arnold takes numerous lead acid vehicle batteries and propane tanks each year at the collections at no charge to GLOW. Ed Arnold Jr. attended the meeting, not knowing why he was asked to attend. Dan Pangrazio, GLOW chairman and Peggy Grayson, Recycling Administration, presented the award. Pangrazio noted that Grayson felt the award was essential that the company be recognized and Committee members agreed. Grayson added that at least in her 20-plus years with GLOW, and most likely since GLOW began in 1987, it was the only time such an award was given. After Grayson read the resolution, Ed Arnold Jr. was presented with a recycled glass award with an inscription that read “In appreciation for contributions toward regional recycling efforts and assistance given to GLOW Solid Waste through the years” by Pangrazio and Grayson on behalf of the Committee. Arnold thanked the Committee and gave members an overview of how the materials collected are recycled. posted by Billie Owens in news, steve hawley, unshackle upstate, business. According to a leading taxpayer protection and small business group, Unshackle Upstate, Assemblyman Steve Hawley (R,C,I-Batavia) was one of only two members of the entire Assembly to receive a 100-percent score based on a number of key legislative votes and sponsorship of bills during this year’s session. The legislation considered covers a wide array of topics, including universal health care, business regulations, budgetary spending and environmental issues. posted by Billie Owens in job fair, batavia, news, business, employment. A Job Fair that is free and open to the public is being held from 10 a.m. to 2 p.m. on Wednesday, Oct. 3, at the Genesee County Career Center. It is located at 587 E. Main St. in Batavia. Additional companies may be added. This is an Equal Opportunity Employers/Program. posted by Billie Owens in assemblyman steve hawley, business, news. Assemblyman Steve Hawley (R,C,I-Batavia) announced today that he has received an 88 percent rating from the National Federation of Independent Business (NFIB) and a 91 percent from The Business Council of New York State Inc. based on a number of key votes during this year’s legislative session. Hawley’s rating puts him in an elite tier of pro-small business Assembly Members compared to many lawmakers from New York City who received failing grades. Votes on various topics pertaining to business were evaluated including taxes, regulations, compensation and labor issues. “As a small-business owner and operator for much of my life, I know firsthand how important it is to cultivate an environment where entrepreneurs are cherished and jobs are created without costly tax incentives,” Hawley said. “New York has far too long been known as anti-business, and that reputation has forced too many of our small businesses and larger companies to leave the state, costing us revenue, jobs and stalling economic growth. I am honored to be considered one of the state’s top pro-business legislators once again and look forward to making New York truly open for business." posted by Howard B. Owens in p.w. minor, batavia, news, notify, business. P.W. Minor this morning filed a notice with the NYS Department of Labor of possible layoffs and a possible plant closing but that doesn't necessarily mean anybody will lose their job, according to Brian Benedict, the company's VP of sales. He said CEO Hundley Elliotte is in town this week working with management on a restructuring plan. Some of the options include both keeping the plant open and retaining all current employees, Benedict said. "As of today, there have been no layoffs," Benedict said. "By filing the warn (notice) we were just following the letter of the law." All of the work crew today was sent home and they are not expected to return to 3 Treadeasy Ave., Batavia, tomorrow. Benedict said at this point he doesn't know when they will start working again. "We will know a lot more by Wednesday afternoon," Benedict said. In the Warn Notice, P.W. 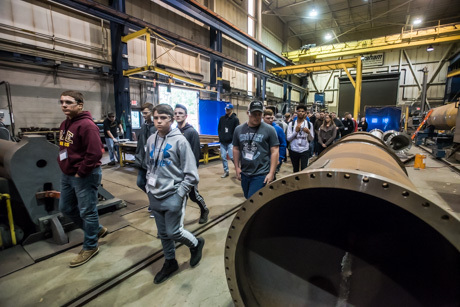 Minor informed the state potential layoffs could mean a loss of 42 jobs, or all 82 jobs at the plant and cited "economic reasons" for the potential layoffs. Elliotte's investment firm Tidewater + Associates acquired the shoe company from Pete Zeliff in February. 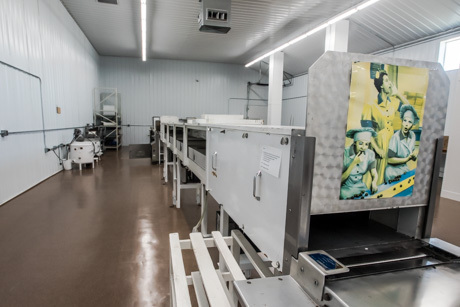 Zeliff and then partner Andrew Young saved the 151-year-old company from certain ruin in 2014.
posted by Billie Owens in business, news, batavia, revival salon, hair salon. 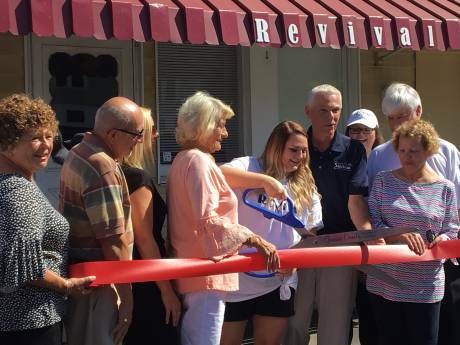 The official ribbon-cutting ceremony for Revival Salon on Sunday afternoon. 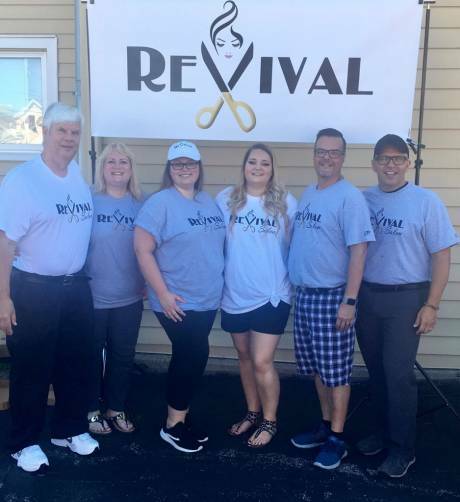 Nearly 100 people attended the Grand Opening of Revival Salon on Sunday afternoon, Sept. 16th, located at 401 Ellicott St. in the City of Batavia. The name Revival not only stands for refreshing one’s beauty, it also honors a very special lady and the goal to carry on her legacy. The great-grandmother of salon owner Jessica Levins was Viola Kulikowski, who owned and operated Viola’s Beauty Salon for nearly 70 years in the same space -- at the corner of Ellicott and Swan streets. Levins remembers watching her great-grandmother at the salon and being infatuated with the idea of owning a business that was exciting and fun. Viola is not only with her great-granddaughter in spirit on this new venture, but within the business name. Viola’s nickname “Vi” is cleverly hidden inside the name Revival. Jessica’s mother came up with the name, while her dad designed the Revival logo. Entrepreneurship is a family trait. The building at 401 Ellicott St. has been in the family since her great-great-grandfather owned a barbershop. 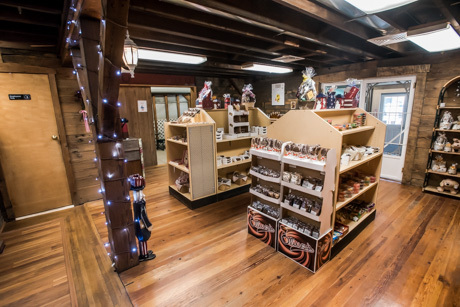 In the mid-'90s her aunt, Pam Reed, owned and operated the “All Victorian” gift shop there. Her Uncle Mark Kulikowski, now owns the building and operated Southside Photography there most recently. Another Uncle Frank Kulikowski, owns and operates Frankly Design laser engraving just down the block. Levins earned her cosmetologist’s license in 2014 and gained experience at a couple local hair salons. Her specialties are colors and updos. She has also worked for the past four years as a counseling aide in the Batavia City School District while earning her bachelor’s degree. As if starting a new business wasn’t enough, Levins is also continuing her graduate work at the University of Buffalo to earn her master’s degree and become a school counselor. Levins has three hair stations that she will be renting out to independent hair stylists. The Revival Salon is starting out by appointment only. Before cutting the red ribbon on Sunday, Levins first and foremost thanked the key people involved with helping make her dream a reality: Small Business Development Center Advisor Sam Campanella; Batavia Development Corporation President Pier Cipollone; BDC Director Rachael Tabelski; BDC Board Member Chris Fix; Genesee County Chamber of Commerce President Tom Turnbull; Rick Hale of Genesee Plumbing; Brian Kemp of T-shirts Etc. ; and Michelle Farina of Michelle’s Catering. She also thanked City and County officials who attended -- District 7 Genesee County Legislator John Deleo; Sixth Ward Councilwoman Rosemary Christian; Fifth Ward Councilwoman Kathy Briggs. Levins gave a special thank you to her parents Debbie Levins (John Deleo), Steve Levins, Stepdad Ed Popil, her sister Melissa Levins, grandparents, and all the family and friends who took the time to come and celebrate her Grand Opening. A well planned out celebration included plenty of food, games, prizes, T-shirts, hats, cups, and giveaways. For more information or to book an appointment at the salon, call Jessica at (585) 402-9269.
posted by Billie Owens in Charge Ready NY, clean energy, electric vehicle charging stations, news, business. Governor Andrew M. Cuomo on Tuesday announced that $5 million is available as part of the first rebate designed specifically for the installation of electric vehicle charging stations at workplaces, office buildings, multi-family apartment buildings, and public locations such as theaters, malls, parks and retail locations. The installation of charging stations for public use supports the Governor's ambitious clean energy goal to reduce greenhouse gas emissions by 40 percent by 2030. Workplace: must have at least 10 parking spaces that primarily serve a minimum of 15 employees who work at or near the lot. Examples include office buildings, universities, schools, and hospitals. New York State Energy Research and Development Authority President and CEO Alicia Barton said,"Through initiatives like Charge Ready NY, Governor Cuomo is helping New Yorkers join the clean transportation revolution that is taking place in our state. Combined with the Drive Clean Rebate, which provides rebates for the purchase of electric vehicles, this initiative is helping reduce emissions by making cleaner modes of transportation a possibility for more and more drivers." NYPA President and CEO Gil C. Quiniones said, "The build-out of an extensive electric car charging network is key to getting more New Yorkers to drive low-emission vehicles and bringing New York State that much closer to its clean energy goals. Our new Evolve NY electric vehicle initiative focuses on addressing infrastructure barriers and our ongoing joint efforts with NYSERDA will help bring more fast chargers to qualifying businesses and nonprofits through our workplace charging programs across the state." Charge Ready NY rebates can be combined with New York State's 50 percent tax credit for installing charging stations. The tax credit is applied after therebate amount received from NYSERDA. Charge Ready NY rebates cannot be combined with other New York State charging station rebate programs offered by NYSERDA, the Department of Environmental Conservation, the New York Power Authority, or other state entities. Reforming the Energy Vision is Governor Andrew M. Cuomo's strategy to lead on climate change and grow New York's economy. REV is building a cleaner, more resilient and affordable energy system for all New Yorkers by stimulating investment in clean technologies like solar, wind, and energy efficiency and requiring 50 percent of the state's electricity needs from renewable energy by 2030. Already, REV has driven growth of more than 1,000 percent in the statewide solar market, improved energy affordability for 1.65 million low-income customers, and created thousands of jobs in manufacturing, engineering, and other clean tech sectors. REV is ensuring New York reduces statewide greenhouse gas emissions 40 percent by 2030 and achieves the internationally recognized target of reducing emissions 80 percent by 2050.